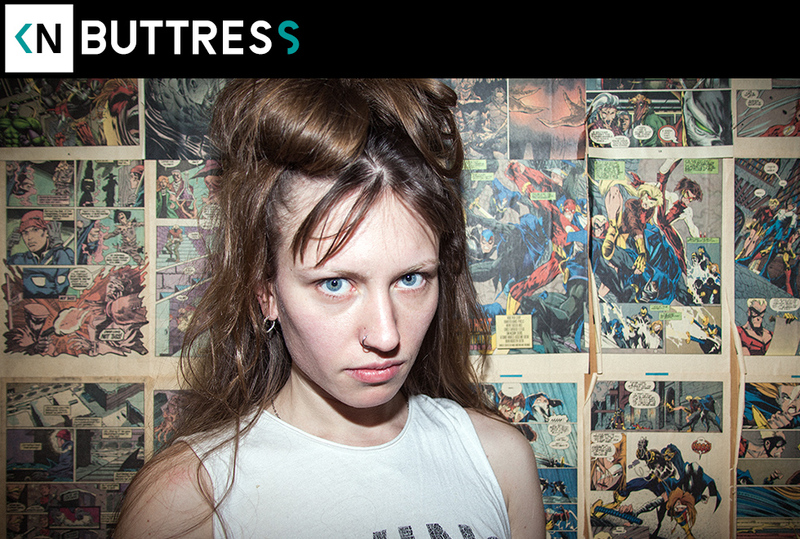 Buttress is an in-your-face character. She doesn’t hold back as a performer, an artist, or as a conversationalist. Born to a strictly religious mother and attending Christian schools throughout her youth, she was once “punched in the gut by God” during a Pentecostal ceremony. While many would’ve used that experience to validate their belief in God, it made her believe in telepathy and begin reading up on the occult. Questioning everything and constant contrarianism seem to be ongoing themes in Buttress’ life. She left home for art school in Savannah, GA to pursue dreams of a career in animation. Like many art students her initial goal soon changed. Realizing Savannah, that school, and animation weren’t a good fit for her, she transitioned into studying film. She moved to Chicago and ended up in an art school with cliched snobby art students… the kind you see in movies. Finding the school’s student body mostly obnoxious, she rebelled against the cultural norms. That’s when she started experimenting with noise music and rapping. Her Youtube channel is filled with dark imagery and dense raps. Her music videos have high production value. She’s able to get across her emotive themes without losing any technical prowess in her aesthetic. Early work has a boom-bap rap vibe, but she assured us she wants to move past that. As she continues on her music journey, experimenting and finding her voice, it seems like she’ll be taking it farther towards left field.